See a report on the future of ITSM. Learn how service automation helps keep systems up. Learn 5 ways to update your service operation. 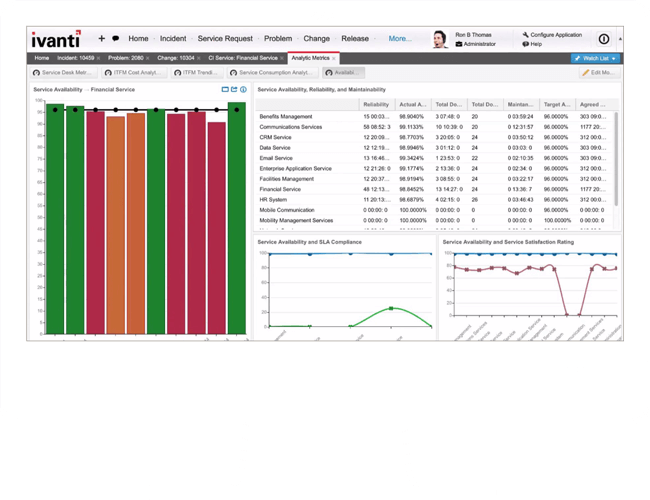 Ivanti Service Manager puts time back on your side, letting you review events over selected time periods to help decide when to replace hardware, install new devices, or redesign services to better meet uptime goals. Track mean time between failure (MTBF) and mean time to repair (MTTR) for assets and services, as well as report service availability against service level agreements. Based on our improved service, we have been able to achieve on average a 99.8% satisfaction rating each quarter with our customers.